One of the things that has been peculiar to cover the past half-decade was NASCAR and the perceptions of doom that surround the sport. This column has addressed before the societal condition of being in a constant crisis mode and how it manifests itself through media portrayal and peopleʻs reactions. The announcement that Loweʻs would be leaving the sport last week came as the latest iteration of such a framework. The theme surrounding the home improvementʻs departure focused on what it means for the sport and how it shows the sport of flailing and how will Jimmie Johnson ever possibly drive a car again, and surely this is the final indication that Brian Z. France will wake up and bring back the old points system and get rid of the stupid playoffs and everything will be copasetic. That Loweʻs is leaving is a blow to the sport, but sponsors have left the sport all the time. Tide. AC Delco. Pontiac. Jack Daniels. Jim Beam. Coors. Losing sponsors is a problem but is also an opportunity. The bigger thing to see is that nothing happens in a vacuum. Anyone here a Loweʻs stockholder? While the stock has followed a pleasant five-year climb, moving from $37.83 /share in 2013 to an all-time high of $107.40 /share in January of 2018, the stock has been falling short of expectations and the company has been wired in a way of layoffs. Those layoffs combined with a solid Christmas season buoyed the stock but it has lost 20% of its value since. 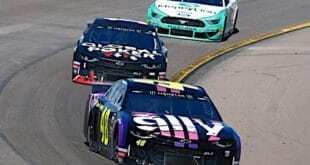 Their decision to leave NASCAR may look bad for NASCAR, Hendrick Motorsports, and Jimmie Johnson, but it is a case of corporate finances and not one of their immediate and far-reaching disdain or dismissal of the sport. It is, instead, a fiscal recognition that spending ridiculous amounts for the sport should be curtailed. Loweʻs is going through the same thing that so many others have done in trying to scale back while also determining ways to better spend their millions. What NASCAR should really be trying to do now is to help lure big-name tech companies and try to show an evolution with the information age. Perhaps the focus has been misplaced, as rather than worrying about trying to keep companies they should be worrying about how to attract them. Then again, the obvious has seemed to be a problem of late. Happiness Is…Harvick. 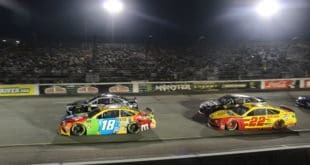 The headlines all showed that Martin Truex Jr. rocked Auto Club Speedway, winning both stages and taking the big trophy in what was a dominant performance. Makes sense. He did do all those things and won by a hefty margin of like 14 minutes or something in a way that may have made fans pine for the days of debris cautions to artificially tighten the field. Kevin Harvick, however, should be kicking himself. As he dorked around with Kyle Larson, finally losing his s&%t and sideswiping the No. 42 driver, he let one get away. He may have struggled to pass Larson but he was still running in the top 4 when he blew it and looked all too probably to continue his dominance. 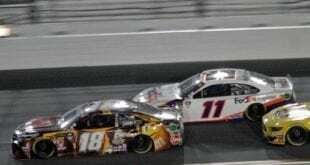 The chance to earn his fourth-straight win of the season crashed into the wall with him and his silly temper tantrum. 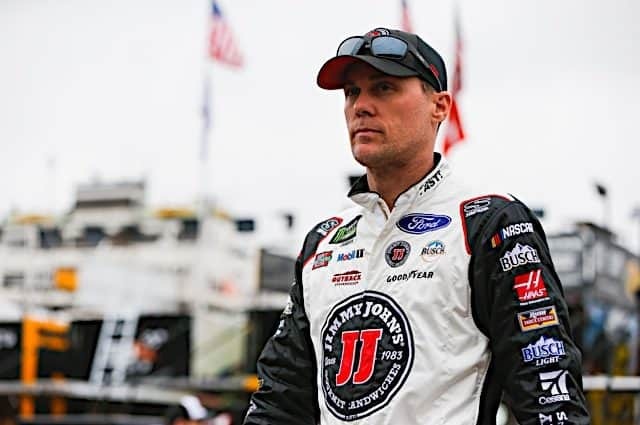 The joy here is that Harvick, for all the different accolades that surround him, can turn into a petulant road rage idiot at times – and for that, we thank him. 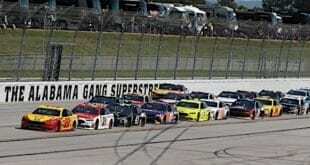 Harvick may not appeal to everyone, but who cares – Jimmie Johnson, Jeff Gordon, Kyle Busch, Dale Earnhardt didnʻt necessarily appeal to everyone either. Itʻs true. But the honest display of futile emotion shows that Harvick can be just like many of us, prone to fits of asininity. Even if heʻs not likable, he ʻs still human in a way that seems sort of normal. Itʻd be boring to watch Harvick suddenly turn into the calm, reserved, vanilla driver that so many seems to despise in Johnson. Hereʻs to more moments like this past Sunday. Happiness Is…Melbourne. For those motorsports fans burrowed under yet another norʻeaster, Melbourne probably looks rather attractive right now. The temperature has been hovering in the low 80s (Fahrenheit) and seems to be rather pleasant even with some rain coming down this weekend. But this point here is not about the weather, the weather is a trivial topic, something to use for times when awkwardness or unfamiliarity permeates the situation, like a dentistʻs waiting room. Instead, the focus here is on the fact that Formula 1 will be taking to the track to get their season started, finally. With NASCAR and IndyCar already doing what they do, itʻs about time that the pinky-out crowd gets their satisfaction by watching model-esque playboys pilot multi-million dollar machines that are so complex that the powerplant is four separate components. Howʻs your MGU-K functioning these days? While this season offers some semblance of hope that Red Bull will be keeping up with the dominant duo of Mercedes and Ferrari, no one really knows until the lights go out this Sunday. There is reason to believe that Mercedes may have been sandbagging their times during winter testing and that Red Bull still is trying to find more from their Renault driven ride. The not knowing is the beautiful part. And that idea is furthered by the notion that the results for McLaren and Toro Rosso are likely as unpredictable as White House drama. You know more is coming, you just donʻt know what it might be. Here, here though. 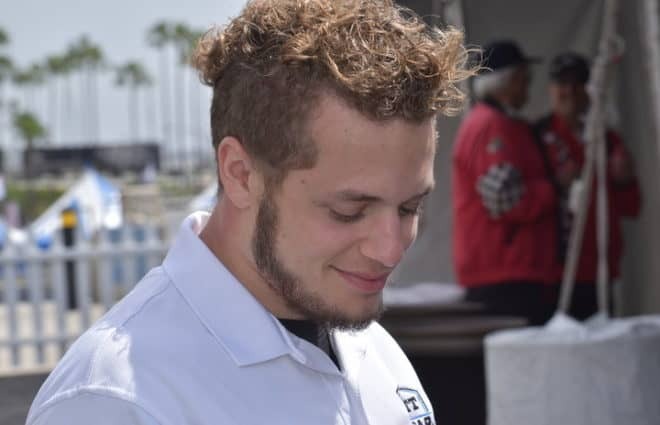 Itʻs time to get the cars on track for a meaningful purpose and to see what may come of it. Enjoy the show.